Kim Unplugged: Randomness: A Dash of Sriracha to the Rescue!!! Is there more to English cuisine than fish and chips? Indeed there is. There's sausages and mash, mushy peas, and kidney pies! Now doesn't that just make your mouth water? Not quite. I don't consider myself a picky eater by any means (trust me, I had to fight with three brothers for food at the dinner table), but I'm just used to food cooked with herbs, spices and a multitude of flavors. After living in London for a little over a month, I decided to satisfy my craving for Chinese food by ordering take-away from a local Chinese restaurant. I requested for some hot chili sauce and not only was I charged £1, but I received a small plastic container filled with hot chili OIL?! Not what I had in mind at all. I expressed my utter disappointment to Nick and we were suddenly on a mission to secure a bottle of Sriracha, also known as Rooster Sauce. 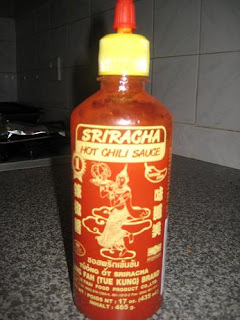 Sriracha is the ultimate hot sauce that my family uses on EVERYTHING from pho and chow fun to pizzas and pate! 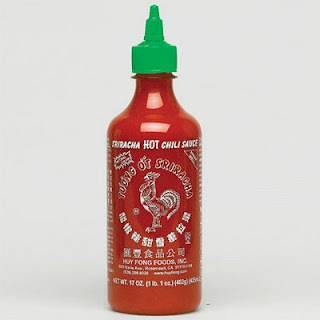 Growing up in San Diego, a city with a large Asian community, Sriracha was readily available at restaurants and supermarkets. In London, it's a bit trickier to find. Luckily for me, a new international supermarket opened right around the corner just last week. We walked down aisle after aisle in search of Sriracha and came across a similar looking bottle with "Sriracha" printed across the top. We were a bit puzzled because the cap was yellow (it's supposed to be green) and there wasn't an image of a rooster on the bottle, instead it was an image of a Thai Buddha. Had the product been rebranded? Is this the same thing? We decided to purchase the hot chili sauce and give it a shot. As soon as we returned home from the supermarket, we put the chili sauce to the test! We cooked Swedish meatballs and dipped them in Sriracha sauce. Our eyes lit up and we both smiled, knowing we would never eat without it again! Although this may not be the original Sriracha brand that my family enjoyed throughout the years, it will have to hold me down for a couple months until I return to San Diego and stock up on bottles of the original hot chili sauce! It's been six days since we purchased the bottle, and so far we have used it on french fries, chips, pizza, sausages, tuna, sandwiches, pate and eggs!!! If you happen to be a fan of Sriracha, check out their Facebook Fan Page and join the discussion! What other foods have you tried with it? this is a bit late now seeing as the original post was a while ago but if you live near central London, just go to China Town. The vietnamese restaurant in greek street i love by theirs in China Town and they have the green capped rooster version.